I took a picture of this with my cell phone. It’s a simple moth. 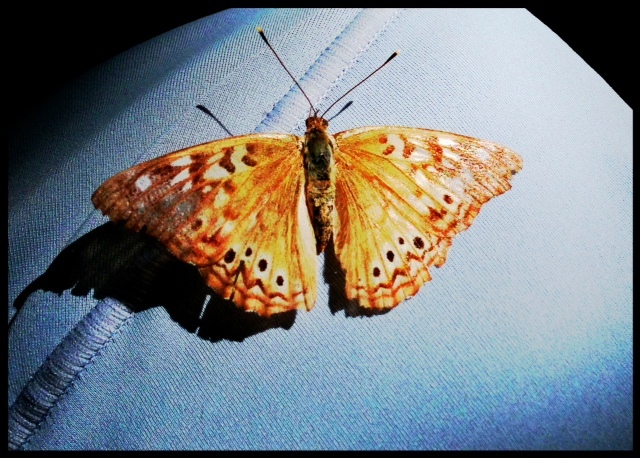 It was on my son’s shirt at the zoo – and a ray of light was hitting it “just so”. I thought it was a beautiful example of how looking at things in the right light, can make ANYTHING look beautiful. Even, a little moth. Isn’t God awesome? When we went on vacation in May, I did a really dumb thing. I let myself run out of my adrenal support, for my cortisol levels. Not on purpose, mind you. Things happen in the month before a trip, finishing school and taking care of 10 people. Sometimes I fail miserably. Realizing I couldn’t find my exact supplement locally I went for something similar-ish at our local store, and it ended up being all wrong. Within 3 days of our trip I was feeling really sick. I thought it was the brown rice in the supplement, which, I’m sure was a lot of it at the time… It was gluten, dairy, yeast, soy, and everything else free. That one “minor detail” isn’t so minor to my body. So I switched back to my original support – PREvacation. Something was still – not quite right. I felt like someone was pulling my shirt – all day long and it was getting worse. Three weeks post brownie binge, and I still wasn’t bouncing back. In fact, I slept through my 4 hour dental appointment to get my fillings replaced. Someone with chronic fatigue. That’s who. I’d force myself to go on runs with my husband, because I really wanted to go… but my body really wanted to sleep. It seemed familiar in a way I didn’t want to recognize or visit again, but I knew sitting around wasn’t the right answer. Ashwagandha Root – is a Nightshade and should be avoided for auto immune protocol. Hmmm. I know that is in BOTH my thyroid and adrenal support… but it didn’t bother me before. WHY now? So this is how it goes… When you get knocked down from a sensitivity of one thing, it seems to grab a friend or two and throw your body down another flight of stairs. This is the beauty of celiac disease and the “mind of it’s own” factor. See why you shouldn’t “CHEAT”…? So the supplements that helped me SO much for 6 months, are NOW, no longer an option. Now was the time I wished there was a “Auto Immune Protocol” list for safe supplements… because this was getting a little crazy. The list of what I can’t have is far out weighing any cans. I messaged my doctor and told her my suspicions and inquired about the main things I should be looking for, throwing out some options of things I thought might work. 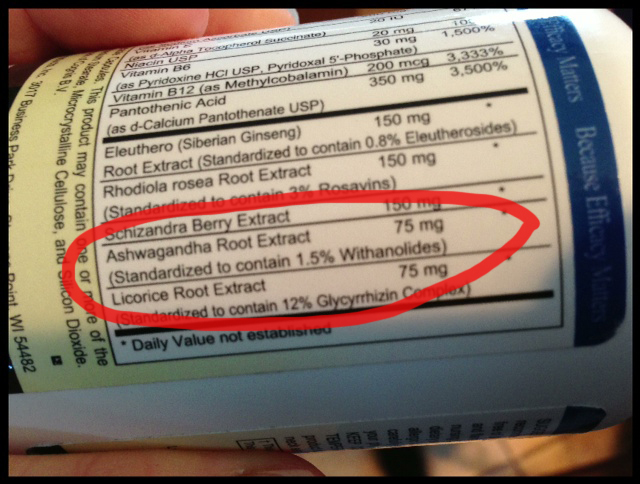 I’d just have to be more specific to make sure the Ashwagandha wasn’t IN anything. I think we got it all worked out. Help is on the way! Amazingly… once the Ashwagandha went away…. I’m still not 100% – but I’m feeling MUCH stronger each day… and it’s SUCH a blessing to know WHY. Now, my poor family who waits until my stress support is in … pray for them. Mom’s been a little crabby and has to get caught back up from that little set-back. I think THIS time, I really have eliminated all things that could possibly cause inflammation. I pray? Did God make a mistake in making me? No. He did not. He made me exactly how I’m supposed to be. It’s my job to take care of the body He blessed me with as safely, and as naturally as possible, so I can be healthy for Him. Posted on July 6, 2013, in Auto Immune Disease, Celiac/Gluten Sensitivity, Label Reading and tagged Ashwagandha, auto immune disease protocol, celiac disease. Bookmark the permalink. 3 Comments. Awesome info—- thanks again—I am checking mine for “Ashwagandha”— just might be one of my problems also!!!!!!!!!! Thanks again so much for sharing this information!!!! 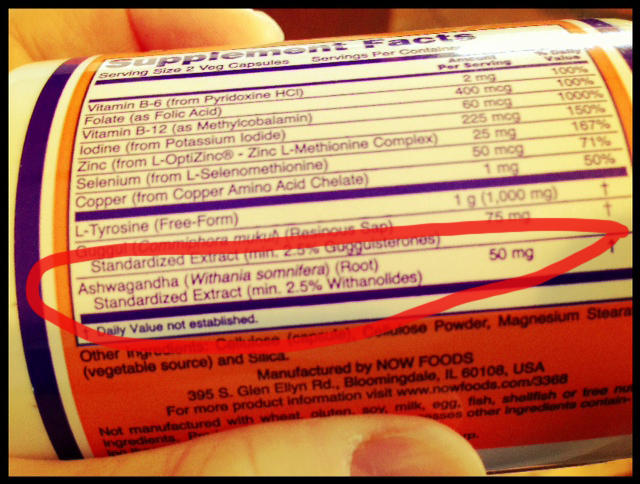 It’s crazy to me, but the supplement I switched to that was all wrong – was ashwagandha. I’m guessing going on a “pure” form of that, then stopping – then coming back to it… made my body recognize it more easily and freak out more severely. I am so thankful that I eat so basically that it’s pretty easy to figure out what is going on – or at least dig in and figure it out. If I ate like I used to with the Standard American Diet of “healthy” – no way would have I a clue what was causing hidden inflammations and messing with my brain!! Praise be to God.